If you actually click on it, you get this page. I clicked on 'breakfast club' and was shown 4 types of cereal I could buy. Then I tried the search box. I just typed in bread to see what came up. Nothing. Maybe I'm just being blonde but I found this very confusing and annoying. We only sell prescription free products online- currently only a range of cereals. I see the word 'free' and 'prescription' in that sentence. 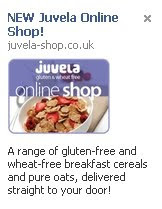 By the way, their standard cereal is £2.99, with delivery - £5.68! Fewer carbs = Longer life? Some great news for those of us on a gluten free diet! "Professor Cynthia Kenyon, whom many experts believe should win the Nobel Prize for her research into ageing, has discovered that the carbohydrates we eat — from bananas and potatoes to bread, pasta, biscuits and cakes — directly affect two key genes that govern youthfulness and longevity." A friend recommended Graze to me as a good source of fibre and a way to snack guilt free. The Graze website is extremely easy to use and every time you receive a box of snacks you can go onto your page and tell them which snack pots you liked, thought average or never want to see again. As you can see each box contains 4 snack pots. My only gripe is that you must make sure to eliminate the 'non coeliac' foods from your preferences straight off to make sure they are never included in your box. Each box is about £3 including P&P so extremely good value. You can get them as often as you like. I get mine every Monday, and my hubby takes a couple to work to eat at his desk. I thought I'd check out the menu anyway as I'm new to the area and it's good to have a mental list of good places to get GF food. I hoped that they'd maybe done a Bella Italia (see previous post). And they have! Marvellous. Again, I don't think I've ever been to a Las Iguanas before so I don't know if the food is just the usual tex-mex microwaved cardboard but I was almost drooling reading through the menu. ENSOPADO DE CARNE Tender slow-braised goat in coconut milk & tomatoes with chillies, carrot & cassava, served with coriander rice, farofa & sweet plantain. Most branches of the Bella Italia chain now offer gluten free pizza and pasta!I got this from the menu of my nearest branch;"Dishes which have no gluten containing ingredients now available, please ask a team member about our pizza bases and pasta. "But if you are really sensitive to gluten, please be aware;"All our dishes are prepared in kitchens where nuts, flour etc are commonly used, unfortunately we cannot guarantee our dishes will be free from traces of these products. 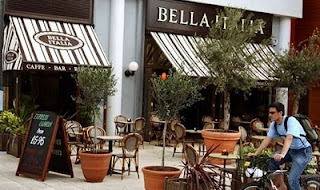 "I don't think i've ever stepped foot in a Bella Italia before. But this is definitely worth a go. Other chain restaurants take note!! I had a lovely night out on Friday in Bristol starting out with a meal and then a few pops on Cheltenham road. I'd seen a few adverts in the local magazine etc for a new place called The Bank of Stokes Croft. They were offering handmade pizzas and 'bowls' for a fiver. 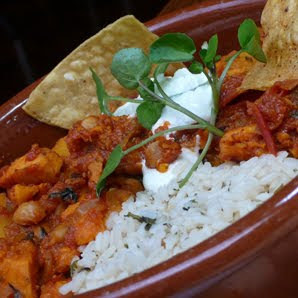 I emailed them about the menu first and they replied with this list of their gluten free items; Goan Fish Curry with Herb Basmati Rice Smoked Sausage Cassoulet (this is what I had) and Butternut Squash, Sweetcorn & Red Onion Chowder. I was told that this particular venue was known for being pretty rough in its fomer incarnation so if you live in Bristol, don't let the bad rep put you off.